A few nights ago while strolling the streets of Split, we found ourselves captivated by the sight of this sphinx illuminated by moonlight. 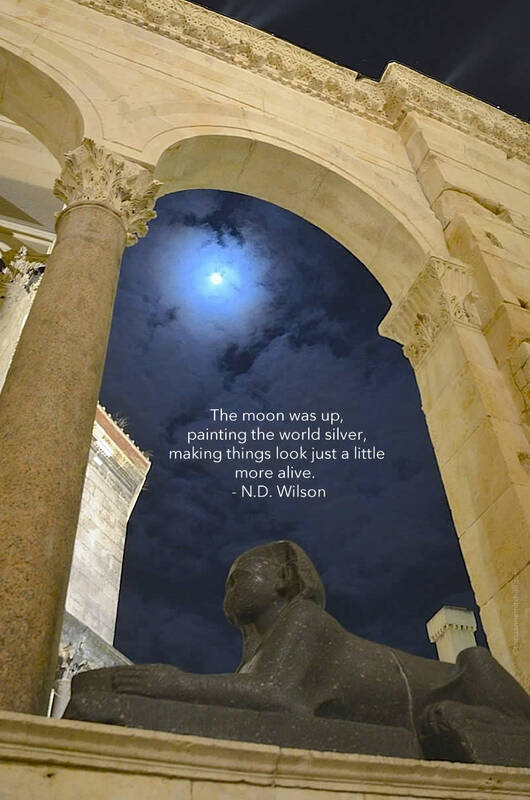 The sculpture, which guards the palace’s Peristyle, is the only intact one that remains in Split. A headless version can be found in front of the Temple of Jupiter (which was later converted into a Baptistery), whereas another is housed in the city’s museum. We remarked that today the palace is roughly the same age to us as the sphinxes were to the emperor who so coveted them. What a gorgeous picture! I love the angle you chose to highlight the moon. So artistic. I would have never thought to do that. Thank you, Juliann. I loved how mystical the scene looked – a full moon over a 3,500 year-old sphinx. What a neat city this is! Amazing photo, Tricia! Looks like a travel poster advertisement. Flattering words, Kat – thank you. :) It was moments like this that I wish we’d had the tripod along. But then, we couldn’t have strolled so freely in this beautiful spot. Wishing you a Happy 2014 just around the corner! Thank you for sharing that. You took a great picture at the right moment and you reflected deeply. That’s really cool! Hi Tricia. I’ll be ringing in the new year at home. I went to the city yesterday. Times Square was already getting set up. It was very crowded all around that area. Tricia, this may be your best photo ever. Definitely in your top 5. Awesome! Manmade beauty and Mother Nature in great harmony here. :) Thanks for the flattering praise, Ruth – and Happy 2014! This is macic, Tricia. Wish you that the new year of 2014 may be filled with blissful adventures and happiness on your wonderful journeys. Here’s hoping that our paths will cross in 2014! Ich wünsche Dir einen guten Rutsch ins neue Jahr! Many thanks for your compliment and for the suggestion, Carol; I’ll check the competition out. Hope the new year is off to a wonderful start for you! Shawn often hears me mention you, so we’ve both enjoyed crossing paths with you this past year as well. It would be fun if they could cross in person this year. Where are you off to next? I just connected with a fellow traveler named Frank (co-author of blog BBQboy) who was inquiring about apartment hunting in Dubrovnik & Split after reading my mammoth Split walking tour post. :-) I offered him advice for Split & Trogir, but sent him your way for pointers on Dubrovnik. Hope you don’t mind and that you’re having a splendid weekend. Tricia, absolutely ethereal. What a perfect picture, great composition, perfect lighting and delightfully delicate outcome. Prem, it’s very nice to hear from you! Your compliment about this image is especially appreciated since I know that you are a gifted and accomplished photographer. Thank you for your kind words.